I never went skiing when I was younger – my family weren’t skiers and we preferred summer holidays to winter holidays. For a while now, I’ve thought it would be really cool to learn to ski – although I’m horrifically clumsy, so it may not be the best idea for me. There are a couple of options near me for skiing – the SnowDome at Tamworth and a dry ski slope at Swadlincote and so there’s plenty of opportunity, I just need to get those lessons booked. Here are five reasons why I want to learn to ski this year. Being able to ski opens up the possibility of more holidays! 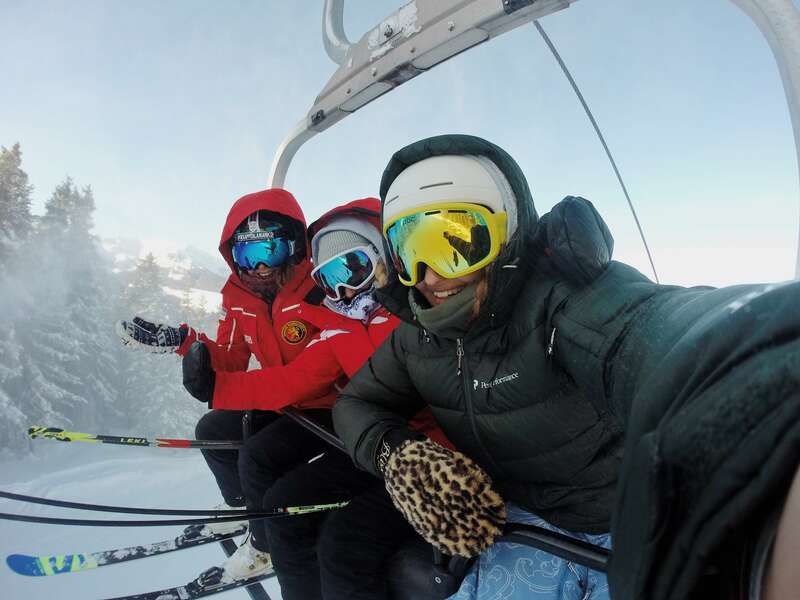 With skiing on the table, you can visit places which aren’t really open to you otherwise – I fancy Meribel in the French Alps (well, if it’s good enough for the Beckhams! ), Gstaad in Switzerland (it has a traffic-free town centre and fairytale architecture – perfect for a winter adventure! ), and St Moritz in Switzerland because it’s exclusive and elegant with a “champagne climate” – 322 days of sunshine with dry air. I also think that staying in a chalet looking out over the mountains would be absolutely incredible and super cosy. Imagine being all snuggled up in blankets with a cheese fondue in front of a log burner – absolute heaven. Apres ski sounds to me like probably the best part of skiing – the party you go to after you’ve finished your runs for the day! Taking place between 3.30 and 6.30pm and is full of dancing, drinks and celebrating a great day of skiing. Plus – you don’t even have to dress up, you just go in all your ski gear! Let’s face it, some ski clothing is seriously fashionable. I love anything with turquoise on it for a hint of 80s skiwear. Also, anything with a fairisle print is more than welcome in my skiing wardrobe. Simply Hike has a great ski clothing collection and I’ve added plenty of pieces from there to my wishlist for once I’ve learned to ski. Anyone who knows me knows that I hate conventional exercise – I haven’t had a gym membership since 2012 (and even then, it was only for six weeks!) and I prefer to get my exercise through long walks and swimming in the sea. Skiing strengthens your lower body muscles as well as burning calories and it looks like it’s way more fun than jogging. Don’t forget that skiing is a high impact sport and so it’s best to be prepared for muscle strain. Use pain relief gel for swelling and keep it in your backpack whilst on the slopes. I’m a sucker for an amazing view and there is nothing quite like snow covered mountains and the views from the top. I’ve never been anywhere quite like this yet and so I’d love to get some beautiful ski resorts ticked off my list.